Brace yourself for another bulleted review because I am still on slacker mode! Anyway, today's featured tome is Mercedes Lackey and James Mallory's THE HOUSE OF THE FOUR WINDS. The first book of their fantasy series, One Dozen Daughters, which is like a modern fairy-tale. A little backstory, with 12 daughters, the tiny duchy of Swansgaard can't afford to marry their princesses off like your typical royalty lest they bankrupt their estate. So the sisters with their parents, the Duke and Duchess of Swansgaard, made an agreement that when the girls turn 18, they are to look for their own fortune or trade in the big bad world. First to leave the nest is eldest daughter, Princess Clarice, who wants to sail off into the New World and be a swordmistress. Instead of a peaceful Pacific voyage, Clarice found herself on board a pirate ship with a sorceress who is in search of riches and treasures that can buy kingdoms. I love the fairytale-like backstory of THE HOUSE OF THE FOUR WINDS with kingdoms and princesses with a modern twist as said princesses are empowered and not herded off for marriage as soon as they're eligible. I'm not a big naval story reader so I love the Pirates of the Carribbean: Dead Man's Chest feel of THE HOUSE OF THE FOUR WINDS with magic, riches, pirates, serpents, and a sorceress which made it somewhat easy for me to read and imagine the events that happened here. The actual House of the Four Wind is a council of some sort and reminded me of the Nine Pirate Lords in that Johnny Depp movie. Not only that, Clarice Swann is a dead ringer for Elizabeth Swann in the movie, played by Kiera Knightly, and Dominick is very much like Orlando Bloom's character. Ha! I love the pirate theme and Clarice pretending to be a boy to secure safe travels only to get the handsome guy in the end. It's a little bit confusing and borderline dysfunctional especially for Dominick, poor dude must think he's gay but it all worked out in the end. I think this is also the reason why MLackey and JMallory didn't highlight the romance too much. Too complicated and can open up for a lot of drama which won't fit well with the lighthearted story. THE HOUSE OF THE FOUR WINDS is "clean" and the romance wasn't the focal point of the story. It's very plot driven which had me glazing over a few times because I prefer my books to be character driven and with much dialogue instead of heavy narrations, descriptions, and internal musings. It took me 4 days to finish reading this and it's a comparatively short fantasy book running at 300 pages only so go figure. There's not a lot of magic that happened here, the first half of THE HOUSE OF THE FOUR WINDS dealt with the obvious world building, plot-setting, character introductions, the mutiny in Asesino, and Dominick's rise as Captain. There were talks of magic and amulets but nothing in your face up until the last quarter when Shamal entered the picture and ensorcelled Dominick. From the sound of things, it seems like Clarice's siblings will provide better entertainment than she did. The next sister is a magician, so I think the next book will have lots of magic, and her younger sister, Damaris, is a firecracker! Her book is the one I'm most excited about. 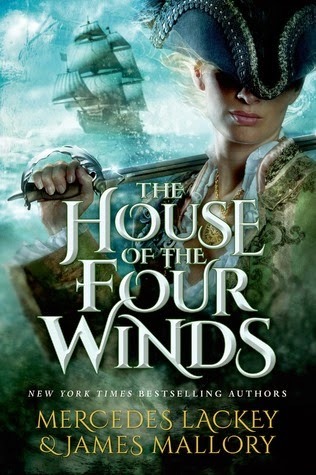 THE HOUSE OF THE FOUR WINDS is good series introduction, I love its fantasy aspect and the fact that it's not romance driven is very refreshing to me. My displeasure over its plot-driven beat and naval theme is subjective so if that's not a deal breaker for you then I'm sure you'll enjoy this better than I did. And yes, I look forward to reading the next book because it looks like each volume will have a different plot, MC's, themes, and settings. Right now it doesn't seem like there's a series plot, THE HOUSE OF THE FOUR WINDS provided a closed conclusion so I'm guessing each book could probably be read as stand-alone. The fairy tale backstory sounds wonderful. I hope the next ones has more magic and character driven than this. I think I would really like the feel of this one too and believe it or not, I don't think I have ever read a book about pirates specifically. I have where there is a pirate involved but nothing like this. Then you will enjoy this if not specifically for the story, at least for the swashbuckling adventure it brings. I prefer a characer driven book too. I was super excited for this one but now it sounds just average. Well, who knows, you might like this better than I did. I can't think of the last pirate themed novel I read, I like that part, but I don't think it has enough energy. Still it would be worth the read for a change. Try a sample, you might end up liking this more than I did. Hahahaha! Don't you just love those emails? Man, I used to love pirate historical romance. I've never read one with magic though, so that's cool. Thanks for the review! I am excited, I received an email yesterday saying a copy of this was on its way..Yep, this sounds like something I will enjoy! Wait, why is a bullet point review a slacker review? I actually like the breakdown.